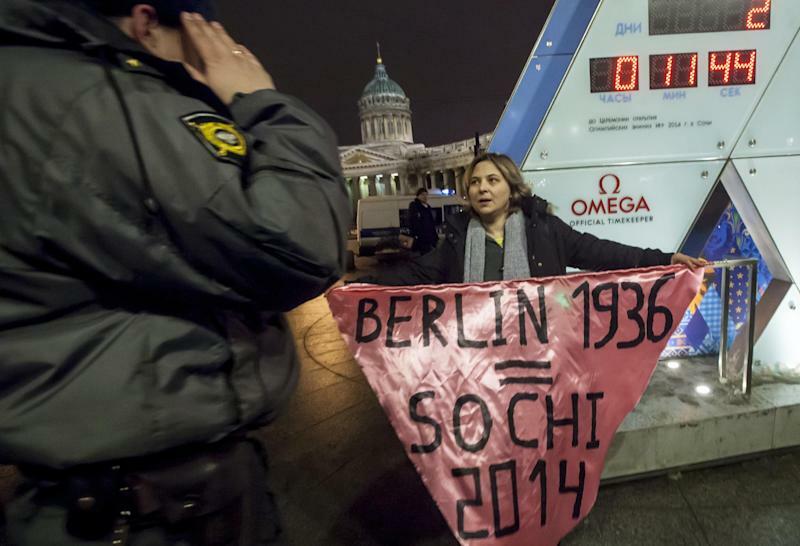 SOCHI, Russia (AP) — A U.S. Olympic sponsor and U.N. panel condemned a Russian law criticized as a stifling of gay rights as protests took place around the world Wednesday, keeping an irritant to the hosts of the Winter Olympics front and center two days ahead of the opening ceremony. Some athletes, barred by IOC rules from political debate while competing, hinted at the law as they began training for events that start Thursday. American figure skater Ashley Wagner joked that Sochi's color scheme — omnipresent inside the Olympic Park — reminded her of the rainbow flag used to symbolize gay pride. "It doesn't really matter where I am. It's still my opinion," Wagner said. "I just believe in equality for all." The law signed by Russian President Vladimir Putin in July bans pro-gay "propaganda" that could be accessible to minors. Critics say it is so restrictive that it forbids almost any public expression of support for gay rights. Last month, for example, a newspaper editor in Russia's Far East was fined 50,000 rubles ($1,400) for publishing an interview with a gay school teacher who defended homosexuality. Detractors have pressed the International Olympic Committee and its corporate sponsors to denounce the law and call for its repeal, launching a campaign on several fronts in July that included a boycott of Russian vodka. One of those sponsors, McDonald's, was targeted Wednesday by protesters in London and Paris, where about 50 people gathered in front of one of the fast-food chain's restaurants in the Place de la Republique square to chant "No to Russia's anti-gay law!" and carry banners with slogans such as "Russia we are with you but we're against your anti-gay law." In London, about 150 people rallying outside Prime Minister David Cameron's office in London urged McDonald's and the IOC's other sponsors to speak out. The activists there said they plan to deliver a petition signed by more than 100,000 people to a nearby McDonald's restaurant. In downtown St. Petersburg, hundreds of miles north of Sochi, about a dozen Russian gay rights activists also protested. 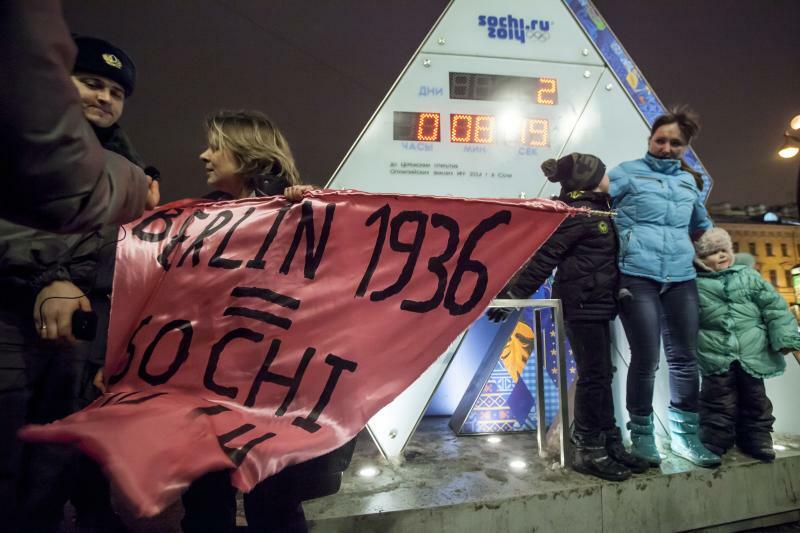 Two unfurled banners reading "Berlin 1936 = Sochi 2014," referring to the Olympic Games held in Nazi Germany. Single person protests are legal in Russia, and the two activists holding signs were spaced far enough apart that neither was arrested. 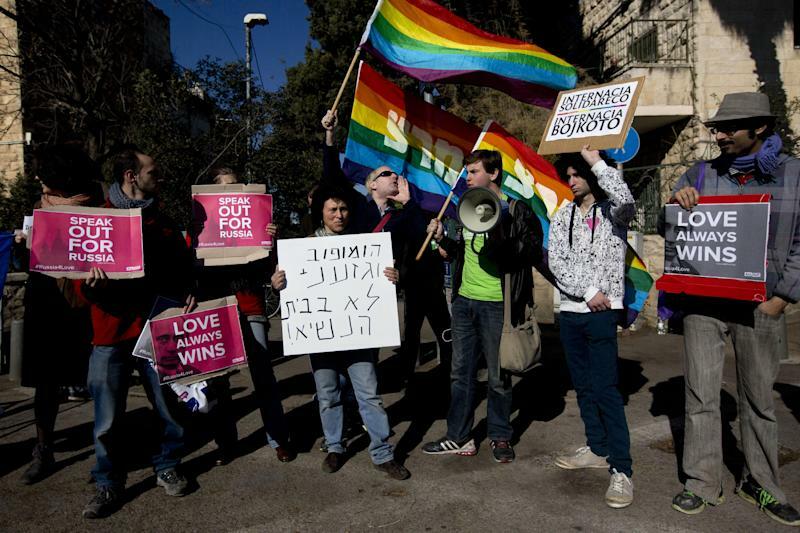 Protesters also gathered in Jerusalem, as the New York-based advocacy group All Out planned demonstrations there and in several other cities worldwide, including Rio de Janeiro, the site of the 2016 Summer Games. Also Wednesday, a U.N. committee on children's rights urged Russia to repeal the law, saying it encourages discrimination and violence. A day earlier, AT&T Inc. called the law harmful to lesbian, gay, bisexual and transgender people and harmful to a diverse society. "We support LGBT equality globally and we condemn violence, discrimination and harassment targeted against LGBT individuals everywhere," AT&T said in the post on its website. AT&T said its statement was a reply to a request from the Human Rights Campaign, an advocacy group that supports the civil rights of LGBT people and has urged the International Olympic Committee's official sponsors to stand up for LGBT equality. AT&T isn't an IOC sponsor, but is an official sponsor of the U.S. Olympic Committee and says it supports the campaign's principles. The telecommunications giant is the first major U.S. corporation to publicly condemn Russia's law, the Washington-based group said. "Other sponsors that have failed to lead should take corrective action immediately," the campaign said in a post on its website. "A company that claims to support LGBT equality should do so wherever it operates, not just in the United States." The issue has presented a challenge for athletes who may have personal views on the issue but are barred by IOC rules from making political remarks or demonstrations during the games. U.S. gold-medalist snowboarder Hannah Teter backtracked Wednesday from an October interview saying she would support a Sochi boycott and perhaps speak out on the issue at the games. "I said that a long time ago and definitely took it back," Teter said of comments she made to Time magazine. "I decided I want to represent the U.S. and show what snowboarding's all about." When asked to denounce the law, the IOC and its top sponsors — who pay millions for the rights to use the Olympic rings and other symbols in television commercials and other marketing — have expressed opposition to discrimination in general and pledged to ensure that people gathering for the Olympics wouldn't be affected. IOC officials and its corporate sponsors have been in constant communication about several issues in Russia, spokesman Mark Adams said Wednesday night. But Adams declined to describe the conversations when asked whether the sponsors had asked the IOC to make a specific statement about the law. A coalition of 40 international groups, including Amnesty International and Human Rights Watch, sent an open letter to the 10 biggest Olympic sponsors last week urging them to run ads promoting equality for LGBT people. On Tuesday, Human Rights Watch posted a video on YouTube of gay people in Russia being bullied, chased and beaten, compiled from footage the group said was uploaded by perpetrators. The video got more than 830,000 views in less than two days. AP national writer Eddie Pells and AP sports writer Rachel Cohen in Sochi, and correspondents Irina Titova in St. Petersburg and Sylvia Hui in London contributed to this report.